Material: 70% COOLMAX®, 27% NYLON, 3% LYCRA®. Proudly Made In The U.S.A. COOLMAX® & LYCRA® are trademarks of INVISTA®. After all, YOUR PERFORMANCE is the absolute most IMPORTANT way to keep yourself safe and happy! 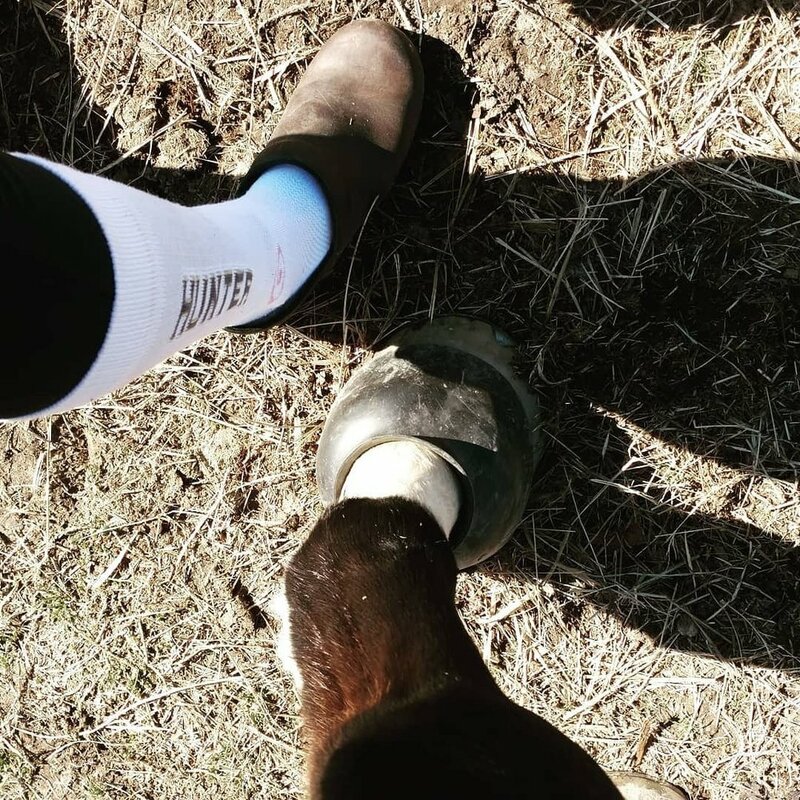 Foot Huggies tested their socks on International competitors as well as amateur riders in Dressage, Jumpers and Hunters before offering you the most amazing Equestrian Tall Boot Sock. They product tested several fabrics for this result. Each pair of socks has a Left and a Right sock designated by the lettering on the outside of the leg. Each sock is knitted with a Comfortable 2" welt to keep socks in place. The Ventilation weave around the top of the foot and outer calf allows breath-ability. Their Double knit padding on the inside of the calf helps reduce bruising and soreness from the stirrup leather. The Achilles tendon padding along with their choice of a perspiration wicking fabric, COOLMAX®, helps reduce blistering, bruising and irritation. The Ankle, and Arch support keep your sock in place where it belongs without bunching. Their double knit padding extends from the top of the Achilles tendon across the bottom of the foot, up and around the toes box keeping your toes from tearing through. Their invisible toe seam is located high up where your toes meet your foot to avoid creating calluses and corns along the outer part of your little and big toes. Their toe box is knitted with the big toe graduating smaller to the little toe so as to eliminate bunching in your boot from excess fabric, creating a comfortable and snug fit. Foot Huggies designed a sock in Small, Medium, and Large not only for foot size but also for accurate height size from ankle bone to just under the knee.